George Dixon, also known as “Little Chocolate,” was born on July 29, 1870 in Halifax, Nova Scotia. Standing only 5’ 3 ½” and weighing no more than 118 pounds over the bulk of his career, “Little Chocolate” was described as long armed and skinny legged, swift of hand and foot, and possessing an ideal fighting temperament and great stamina. Ring magazine founder and editor, Nat Fleischer, described him as a marvel of cleverness, yet indicated that he could slug with the best of them. Fleischer rated him as the # 1 bantamweight of all time. 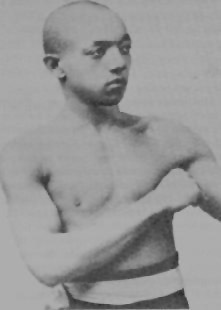 Dixon became the first black man to win a world championship when he captured the bantamweight title just shy of his 20th birthday by defeating Nunc Wallace of England in 18 rounds on June 27, 1890. Only 13 months later he knocked out Abe Willis of Australia to garner the featherweight crown. He held that title for the next six years, finally losing it by decision to Solly Smith on October 4, 1897. He regained it on November 11, 1898 by defeating Dave Sullivan, but then lost it for good when Terry McGovern knocked him out on January 9, 1900. George Dixon retired from boxing in 1906 with an overall record of 63 wins, 29 losses, and 48 draws. Many claim that hundreds of his fights that took place in dance halls and theatres throughout the country were never recorded. Some credit Dixon with founding the so-called “black school” of pugilism which included such greats as Joe Walcott, Joe Gans, Sam Langford, and Jack Johnson. Dixon introduced Walcott to his manager Tom O’Rourke, and the two fighters became associates enabling Walcott to learn under Dixon. Gans was a good friend of Dixon and also studied under him, and eventually provided some instruction to a young Sam Langford, while history’s first black heavyweight champion, Jack Johnson, served as a sparring partner for Walcott early in his own career. John D. McCallum, The Encyclopedia of World Boxing Champions (Radner, Pennsylvania; Chilton Book Co. 1975); www.cyberboxingzone.com and www.boxrec.com.